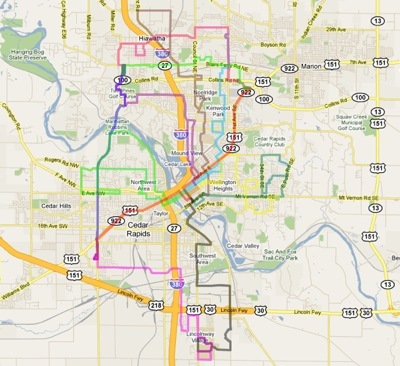 A public hearing will be held at the July 27 Cedar Rapids City Council meeting to consider bus route and schedule changes recommended in the recent Cedar Rapids Fixed-Route Transit Analysis. Any interested individuals or groups are encouraged to attend and speak for or against any of the proposed changes. The meeting starts at 5:30pm and is held in the Council Chambers at Hiawatha City Hall. Several improvements have been made already to the transit system, since a change in leadership and departmental reorganization a few years ago, which separated transit and parking into separate divisions. A greater emphasis has been placed on safety and customer service, and some improvements have been made in marketing. The purchase of new low floor buses has started to modernize the very old, rundown fleet, which, in fact, was the oldest fleet in the country of any transit system based on average vehicle age. Route and schedule changes being proposed to the City Council are the result of a Fixed-Route Transit Study conducted this past fall by SRF Consulting and Bourne Transit Consulting. Recommendations were intended to be implementable right away, focused on improving legibility and efficiency of the system without significantly increasing costs. These changes are an important first step to improving transit in Cedar Rapids. Learn more about the transit study and recommended changes here. If you are interested in the future of public transportation in Cedar Rapids, please attend and show your support for these changes. For anyone unable to attend, written comments can be sent to the Office of the City Clerk, 3851 River Ridge Drive NE, Cedar Rapids, Iowa 52402 prior to the hearing. New weekly update on news and development in the City of Five Seasons. It’s time to enjoy. Tomorrow, July 15, CR Transit will begin running four new 35 foot, 2010 Gillig Lowfloor buses, that arrived July 2. Part of an effort to finally modernize the system fleet, this order follows the first order of brand new buses last summer, along with an additional five coming next year. For years Cedar Rapids purchased only used and refurbished buses, which had more mechanical issues and were less attractive to riders. Having modern, new buses is critical to improving the system, but CR Transit still has a long path to becoming a better transit system fit for Cedar Rapids’ size. CR Transit will have one of the new buses on display during the Kernels game this Saturday, July 17, from 3:30 – 5:30pm at Veterans Memorial Stadium in celebration of the 20th Anniversary of the American with Disabilities Act. Fans can check out the new bus and is an opportunity for people who have never ridden the bus to see how easy and convenient it can be. In a finely-worded press release this week, two public meetings were announced for August regarding PCI’s Medical Mall development. Earlier this year PCI proposed closing 2nd Avenue SE between 10th and 12th streets, claiming it was the only configuration they could fit all their programs without disrupting ground level connectivity (despite two adjacent blocks that are proposed to be surface parking in their plan). Initially most members of the City Council seemed cool with this, giving PCI a favorable impression to their proposal, but heavy public opposition soon followed. Most vocal citizens are concerned with the traffic effects of closing off 2nd Avenue and the cost required to convert 3rd Avenue into two ways. I am opposed to the street closure, not for vehicular traffic, but the barrier it will create between downtown and the surrounding residential neighborhood and disruption to the urban pattern. (I will argue this position more precisely in a later post.) The meetings will be held at the Crowne Plaza Ballroom on Wednesday, August 4, from 4 – 7pm, and Thursday, August 5, from 11am – 1pm. Also, the City Council is likely to approve spending $124,336, for Alliant Energy to burry power lines along 7th Street E from A Ave NE to 8th Ave SE, in anticipation of future streetscaping along the street related to Medical District improvements. From Rick Smith’s City Room blog: “According to a city staff report to the council, Interstate Power and Light Co. needs to install a new transmission line along Seventh Street SE, and putting it underground would cost the city less now than to do it later. The city has agreed it would pay the extra cost to move lines underground, the staff report notes.” These improvements will help improve the aesthetic of the new Medical District and the area around downtown. A design team of OPN Architects, Ellerbe Becket and tvsdesign has been selected for the new Cedar Rapids Events Center, which will include a renovation and expansion of the existing US Cellular Center and a large addition housing new meeting and exhibit space. 3rd Street NE will be closed between 1st and A avenues and then new addition will occupy that space and half of the adjacent block, wrapping around behind the Roosevelt Hotel. Most likely the Roosevelt parking garage facing 1st Avenue will remain as well. This is a truly exciting project for downtown Cedar Rapids and will provide much needed upgrades to our convention facilities to attract more events and people downtown. The project timeline set out by the city is quite swift with construction to begin late next summer and be complete by the end of 2012. Keep up on the Events Center progress on the City’s CR Progress webpage. A ceremonial groundbreaking took place this morning in the 800 block of 2nd Street SW for the new Linn County Juvenile Justice Center, which will house juvenile courts and related services that were formerly in the basement of the county courthouse on Mays Island. 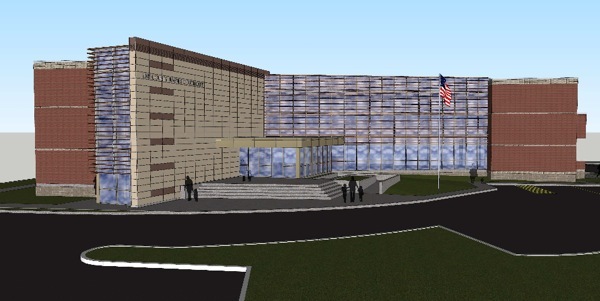 The building design was by Design Dynamics Inc. of Cedar Rapids; rendering below. Today coming home from work I had a different bus driver than normal on Route 3. Driving eastbound on 3rd Avenue, a few blocks out of downtown, an SUV from out-of-state pulled out in front of the bus, only to immediately turn into the next driveway. The bus driver, of course, had to slow down, but instead of simple braking a little until the path was clear, she laid on the horn. It was completely uncalled-for, overaggressive and unprofessional. I have experienced other incidents while riding CR Transit where drivers overreact and honk their horn if a car pulls in front of them or cuts them off. This can be frustrating – just as it can be for any other driver – or cyclist or pedestrian. But driving a 35-40 foot long, multi-ton bus safely and responsibly demands some restraint and a simple assumption that other drivers on the road aren’t paying as much attention as they should be. Honking the horn out of frustration, rather than an actual imminent hazard can be dangerous and make buses look like “bullies” and can give people a negative connotation about transit and bus drivers in particular – especially those who are being honked at. The vast majority of drivers at CR Transit are safe, courteous and professional, however, as a bus driver myself with CyRide, l do notice a different driver culture and a higher tolerance of aggressive behavior. As a passenger these incidents degrade the quality of service and my impression of the system. The winning “Cybrid” design has been picked for the 10-12 new Gillig hybrids coming soon to CyRide’s bus fleet. Just over 80,000 people voted in an online poll on CyRide’s website to pick from three different designs, with a landslide majority win for the “Gold Leaf” design. CyRide received $1.6 million in 100% federal funding through the 2009 Recovery Act to upgrade diesel buses to hybrid. It has been common for transit systems across the nation to specially brand hybrid buses to promote “going green” and the environmental benefits of riding transit. The first nine Cybrids are scheduled to arrive in Ames by July. Yesterday evening (Friday, Jan 15) I decided to explore beyond my neighborhood of Trastevere (photo above) in a direction I hadn’t gone very far yet. I had purchased five single ride bus tickets (BIT) earlier at the tabacchi so decided to ride the tram line 8 out to the endpoint at Cosatello and go from there. Throughout my explorations I discovered some more neat pedestrian-friendly and happening streets outside of the central city antiquity, and also picked up a few things about the transit system. The tram ride to Cosatello took about ten minutes or so. As visible on the map, once away from the heart of Trastevere near the river, the urban pattern becomes much more gridded and regular. The area is of course much newer than central Rome but besides a few main thoroughfares, the streets maintain a human scale and the buildings are mixed-use, in many cases more visibly active than many buildings in the older parts of the city. Typical apartment buildings there are five to six stories and stucco with muted colors. Facades are generally plane, but made lively by inhabitants. Autos are much more dominant on the streets, which are certainly more “friendly” to cars. The tram past a Ford dealership, though still extremely tiny by American standards and fully contained within a building. Car lots are non existent here. There were also some larger gas stations along the main roads as well. A lot of places, especially closer to the center of the city, tiny filling stations are located along the side of the roadway and cars simply pull over. I’ve noticed all of them seem to have attendants so perhaps self service is either not customary or legal. Once I reached the tram endpoint I backtracked a few blocks until I came to Via Edoardo Jenner, a pleasant street characterized by apartment blocks with specialty shops at sidewalk level. I stopped at one complex of four apartment buildings that had a nice entry courtyard in the middle to sketch. As I continued further down the street it turned into a much more active retail district. After a number of blocks the concentration of retail terminated at a piazza so I turned the corner and went a few blocks to another major thoroughfare Viale dei Colli Portuensi. This street was much wider than the one with the tram, with several lanes and generous setbacks. The scale of buildings were similar, but most were not attached to each other on the sides. In one sense it felt very suburban, but at the same time most ground floors of buildings were active by shops, restaurants, and commercial entities. Aside from the architecture, it somewhat reminded me of the wide avenues in some newer areas in the District of Columbia. In fact I notice a lot of parallels in different parts of Rome to certain attributes of various American cities I’ve visited. I originally did not intend to venture to far away from the tram and until one point, even when I had gone quite far, was planning to simply turn around and return along the same route. But once I had been walking quite a distance I decided to simply follow the major thoroughfares I came upon and make a big loop back to tram. You can see my large loop on the map. My turn on to Via Portuense was by a narrow sidewalk along an off ramp. When I reached the next major intersection I began second guessing my direction. However after pondering a map at a bus stop sign for a moment and looking at the route information provided on the sign, I was able to use the bus stop signs to confirm I was heading in the right direction. For each route serving a particular bus stop, the sign lists every street it goes on and how many stops on that particular street. I noticed the majority of routes at the stops I was passing had final destinations at Stazione Trastevere. At one point I walked too far past a street I needed to turn on, but realized about a block past when there were no more routes listed for Trastevere. 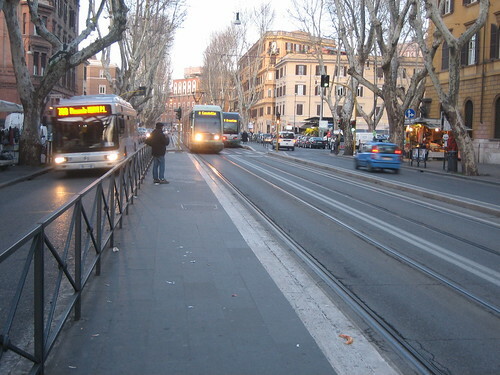 Eventually I simply stopped at waited for one of the Trastevere buses – took route 774 – to get back to the tram. Of course once I got on the bus I discovered the tram was only about a block further away. It was an enjoyable exploration outside of central Rome, but nonetheless a bit tiring. By using the bus stops to confirm my direction, I was able to better understand all the information on the sides and now the system seems much more legible to me. For someone with a broad knowledge of street names in Rome, it’d be quite easy navigating the system simply using the information provided at stops. Unfortunately the Roma ATAC website is not quite as thorough, particularly for buses, which is why it was less clear to me at first. Of course, knowing where you want to go is critical for getting around by transit, which was my main inhibition at first – simply not knowing anywhere to go outside of central Rome. I look forward to exploring more of the Rome metro via transit. > Photos: (004) Friday urban history walk at Forum and Colosseum. The following post was written by my friend Matt Herbst who recently moved to Seattle. Matt graduated from Iowa State and now works for Microsoft. So far he’s been getting around by transit and shares with us his experience living car-free. The heart of urban thinking is how people live their day. Since a lot of Americans spend so much time in their commute, many times a couple hours or more every day, it makes sense to put emphasis on transportation in city planning. Unfortunately for midwestern towns like Cedar Rapids or Des Moines, almost all of the transportation eggs went into the wide road and plenteous parking lot basket. After living in Ames for about four years, a city which tells one of the only bus success stories in Iowa, I got used to seeing buses all over the place and consistently got lost whenever I used them. Then I moved to Seattle. 1. Can’t leave the city. Renting a car is an easy option if this only happens once a month or so. 2. Slower on transit. For a commute, this is easily avoided, but unplanned trips across town can take 2-3 times as long if you’re unlucky. 3. Can’t haul stuff. Again, you can try renting a truck, but even if you have a car, it might not be able to haul big stuff anyway. 4. Buses don’t run at night. A taxi or a ride from a friend works in this rare situation for me. 5. Transit is inconvenient. If you don’t know the system, it can be a hassle. 1. Pollution, if you care. You can cut a lot of emissions. 2. Gas. Never have to buy it. 6. Dealing with traffic. Reading and texting are possible on a bus… so it’s no big deal. 9. Tickets of all kinds. That’s right, cars are inconvenient. With a car, you always have to return to a parking spot… so your path through town needs to be a circle. With a bus, I can walk from one side of downtown to the other and then just grab a bus instead of walking back. Easy. Certainly cars have a role in a good transportation system, but the fact that almost everyone in the US (4 out of 5) has a car is astounding. Perhaps people associate living without a car with the helpless feeling you get when your car breaks down. However, after learning a few bus routes, it’s nice not having to worry about all of those problems cars bring and it’s a bit liberating. If your city has a transit system, give it a try. See if Google Maps has transit directions for your area (but note that in Seattle, the KC Metro website has better directions). The folks you’ll encounter will help you out and you’ll be surprised how fast and easy it can be. The third CR Transit Study open house was held this week on Tuesday, Nov. 24. I attended the earlier session from 1-3pm at the African American Museum. Both consultants Joseph Kern and Bob Bourne were there, as well as Sushil Nepal from Community Development / Corridor MPO. It was good to finally meet Bob, who was the director of CyRide for 25 years and made it what it is today. About 20 members of the public were in attendance, including a handful of concerned teachers and students from Prairie. Mayor Kay Halloran also made an appearance. I was pleased to see recommendations for system improvements as well as route changes. Many of these recommendations echo changes I have suggested in previous posts to make the system more legible and user-friendly. Regarding marketing, operations, and fleet, a few recommendations include: a new system map, real-time bus tracking, getting on Twitter, and displaying a route number, route name, and destination on all buses. Read my entire review of route changes over at the Cedar Rapids Bus Party blog. The second CR Transit Study open house was held on Tuesday, October 20. The study is being conducted by SRF Consulting Group and Bourne Transit Consulting to analyze the current system and propose route changes to improve service. Various route options were presented at this week’s open house. The consultant’s final recommendations will be presented at a third and final open house on November 24. During the summer I took a stab at my own hypothetical plan for improving the CR Transit system, developing a nearly complete system of modified and new routes. While my plan was much more idealistic and simply based on my own general knowledge and assumptions of transit operations and Cedar Rapids, I ended up not completing it. My original intent was to create a new route system with multiple transfer hubs – downtown, Lindale, Westdale, and the AEGON area at Blairs Ferry and Edgewood Road NE. My incomplete proposal is seen below. Click the image for an interactive Google map. Laying out the routes proved more difficult than I figured, because I attempted to maintain similar route distances between hubs so buses could realistically be scheduled to meet at the same time. Using the distance and schedule of CyRide’s main fixed routes (Red, Green, Blue, Brown) as a rule of thumb, I tried to keep each route at around 7.5 – 8.5 miles (in each direction) to correlate to about 35-40 minute of travel. I was also hesitant to remove much existing physical service, even though a big issue with the current system is routes that loop throughout residential streets simply to increase the physical transit coverage without adding addition routes, but at the expense of directness and travel time. A route hierarchy system was something I tried initially, with a system of four to five high frequency cross-town routes between major hubs, complemented by shorter, less frequent “normal” routes. This was based on Metro Transit’s High-Frequency Network in Minneapolis, with twelve major crosstown routes that operate buses every 15 minutes or less throughout the day. I quickly discovered a hierarchical system would not really work in Cedar Rapids because of its relative compactness (compared to MSP) and low ridership. However, a higher frequency could make sense along certain corridors, such as First Avenue between downtown and Lindale, which is a consistently busy route section already. It was interesting to look at the consultant’s proposed route change options and see how they compared with my own ideas. Generally I agree with most of the proposals and think they will help the system function more smoothly and provide more opportunities for alternative transfer points and route connectivity later on. Each route was provided a minimal modification scenario and a moderate modification. I won’t go through all of them since I wasn’t actually at the open house, and Samantha Dahlby has already written an extensive review on several of the route modifications on her Bus Party blog. However, I would like to comment on Route 3 and the 5’s. Above is the minimal and “moderate” route modification proposed for Route 3 that was presented at the open house this week. The green represents unchanged sections of the route, red is removed sections, and blue is for new sections. As you can see, the minimal modification is just that, only removing a few small loop sections, but the route stays essentially the same. These minor changes would reduce overall route distance slightly, allowing the bus to run a full trip within 60 minutes without having to fight the schedule. Next, the “moderate” modification is actually quite extreme – it removes the route all together. The justification is low ridership and that a few other routes serve the area close by, including 4, 6 and 5B. Personally I have issues with this because it is the route I’ve used the past three summers to get to work, because it runs right behind my house. The Route 5’s, which run along First Avenue East, is about a five blocks away, which isn’t bad, but it certainly wouldn’t be as convenient. Luckily, I don’t foresee this option being implemented, but we probably won’t be seeing any service frequency increases on Route 3 anytime soon. Route 5 is currently made up of three separate routes: 5B, 5N, 5S. All three run along First Avenue East from downtown to Lindale Mall, which from there they split into three different routes. 5B serves northern Cedar Rapids and Hiawatha via Blairs Ferry and Boyson roads. 5N (5 North) continues into Marion and loops around the northern half of the city. 5S (5 South) runs through the southern half of Marion. One of the 5 buses departs downtown every 30 minutes, providing half-hour service along First Avenue between downtown and Lindale during all hours of service. But each individual bus only actually runs every 90 minutes, so beyond Lindale Mall, the 5’s only ever run at that frequency. 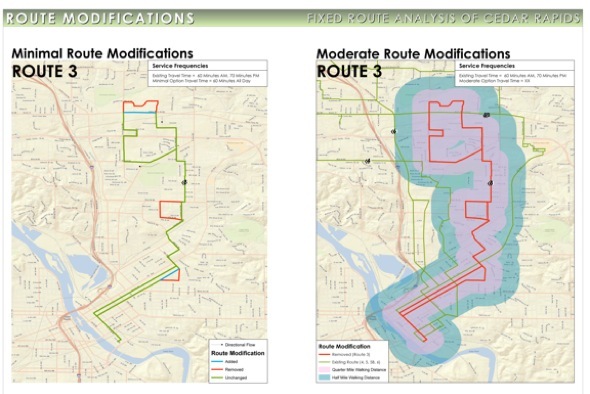 All of the consultant’s proposed modifications to the route 5’s are past Lindale. I don’t have much to comment on the changes specifically, but ultimately I think the areas served by the 5’s, particularly Marion, would be better served by making the segments beyond Lindale separate routes with individual identification. In my proposal, I had a route running along First Avenue between downtown and Lindale, then connecting routes would run into Marion and north Cedar Rapids. Since the heaviest ridership on the 5’s is along First Avenue between downtown and Lindale, it might be feasible to have a shorter route with an even higher frequency than the current 30 minute headway. Then Marion could be served by either one or two looping routes, providing more frequent (likely 30 minute) service within Marion, with connection to routes at Lindale to go toward downtown Cedar Rapids or elsewhere in the northern area of the metro. Separating the three 5 routes individual would also help avoid the confusion of having three separate routes all numbered 5. Additionally, better information and marketing would help make the system easier to understand and potentially more attractive to “choice riders” – those riders who are not dependent on transit as their primary means of getting around. It is important to make transit information readily available in a variety of mediums: on board, in bus shelters, and online. The only information currently provided consists of individual route maps and schedules, displayed in the temporary waiting room trailer at Lot 44, in pamphlets on board buses, and on the CR Transit website. There is now a comprehensive system map available on the Corridor MPO website, but it is not available directly from the transit website, nor is it available to those without internet access. Graphically it is not very professional or legible. A professionally designed system map needs to be made to improve legibility, as well as public image of the system. Service stops along bus routes are currently marked with generic bus stop signs that denote which route or routes serve that particular stop. Several stops around town have bus shelters, but they do not display any addition transit information than a stop with only a sign. These shelters would be a good opportunity to improve convenience / user-friendliness by displaying a system map and schedule information for the route or routes that service the particular stop. Another key part of improving transit and attracting more riders, is to promote the system through branding and better marketing. I don’t mean advertising, but some simple steps to increase visibility and making the system more attractive and user-friendly. A new website, perhaps even with its own URL ( www.CRtransit.com instead of www.cedar-rapids.org/transit maybe? ), with useful, easy-to-navigate schedules, detailed maps, and information on transferring between routes would be a helpful resource. Getting on Facebook and Twitter, too, could increase visibility even more, and be used to provide instant service information to riders. These would be relatively inexpensive, yet critical, ways to make transit more accessible and attractive to choice riders – those who are not dependent on transit. Additionally it would finally provide those dependent on the bus system the most basic of transit information. Like all across the country, more people in Cedar Rapids are looking to transit for an alternative to driving everywhere. Environmental concerns, a renewed interest in urban living, and most importantly, rising gas prices have created a renewed interest in transit and demand for more service all across the country. The Cedar Rapids Transit system has been lacking for years and is long overdue for improvements so it can be a more viable, efficient means of transportation. Now is the right time for us to be planning and implementing initial transit changes, just as we are planning for an even better Cedar Rapids as we rebuild following the flood. The increased public interest, particularly among younger, potential choice riders makes me optimistic for the future of transit in Cedar Rapids. The third and final transit open house will be held November 24, where final recommendations for route changes will be presented. I came across the “Overheard on Cambus” blog, where passengers and drivers alike can submit stories “overheard” on the bus. It was started in mid September but already has dozens of posts. After doing a quick search I discovered there’s also an “Overheard on CyRide” blog, which actually appears to have been started a month earlier in August, but so far has not picked up like the Cambus blog has. Cambus is the university-operated campus shuttle system at the University of Iowa and is nearly entirely student run. CyRide is operated by the City of Ames, but the majority of passengers are Iowa State students. With a large proportion of student drivers, including myself, CyRide combines the fun and easy going culture of a college bus, with the professionalism and customer service of an urban public transit system. Fellow Cedar Rapids Transit advocate, Samantha Dahlby wrote on her Bus Party blog about her appreciation for the friendly and helpful bus drivers. I would agree that an overwhelming majority of CR Transit drivers are friendly, but with both a driver’s and passenger’s perspective, I often find myself either critiquing drivers or considering ways to improve my own passenger relations. At CyRide, providing value-added service to customers is number three of four core principles, just behind 1. safety, and 2. waving to other drivers. : ) I delight in providing friendly service to passengers and honestly consider it one the perks of my job. As a university student, interacting with so many different members of the community while driving a bus has really given me a sense of connection with the Ames community that a majority of students may not experience. Samantha is a member of the Corridor Metro Planning Organization and organizes monthly “bus parties” to encourage those unfamiliar with the Cedar Rapids transit system to try it out. Increasing awareness is an important step among many to start improving transit in Cedar Rapids, which is currently lacking for a city of its size. Check out the Bus Party blog for more information and to read some commentary and ideas from another local transit advocate. This is probably also a good time to once again plug the Corridor MPO’s CR Transit survey. Feedback will assist the consultants currently studying short term transit improvements and changes. The first of three open houses for the study will be held this Tuesday, Sept. 22, from 6pm – 7:30, at the Crowne Plaza Ballroom. Unfortunately I won’t be able to attend, but look forward to seeing what changes the consultants propose.